Hi lovelies! Today's post is all about an amazing competition I was invited to enter. Impulse and Model's Own have collaborated to create these stunning little body spray/ nail polish kits. The sets are just £4 each, which is amazing considering they're worth £9 each! Each set comes with an impulse body spray, a cute mini (but still very decent sized) Model's Own polish and a handy handbag sized nail buffer. 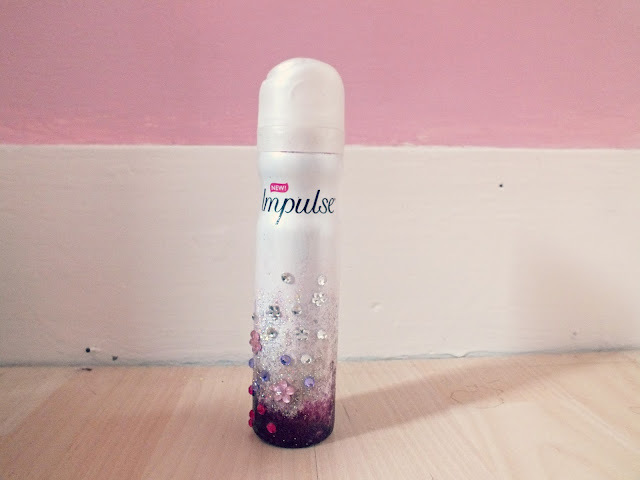 I have to say, Impulse is not something I'm usually drawn to in the shops (que year 7 P.E changing room memories...), but they have seriously upped their game since I was younger and I'm super impressed with all the scents. They're perfect to pop in your bag to freshen up during the day, particularly if like me you have long, busy days at work or are heading in and out of London fairly regularly as I have been recently. Tubes in the summer are not our friends ladies. 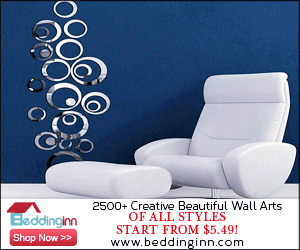 There are three of these sets each with a different scent and corresponding polish colour. Very Pink is a pretty blend of Roses and Grapefruit, very sweet and girly! This comes with the Models Own Nail Polish in Gun Grey. Very Very Pink is a deeper scent than Very Pink and smells of Orange and Whitewood. This was accompanied by the gorgeous Models Own Polish, Utopia. Sweet Smile is a gorgeous, fresh fruity scent, combining Pear, Mandarin and Jasmine. It comes with the Models Own Polish Coral Reef. So, onto the competition! 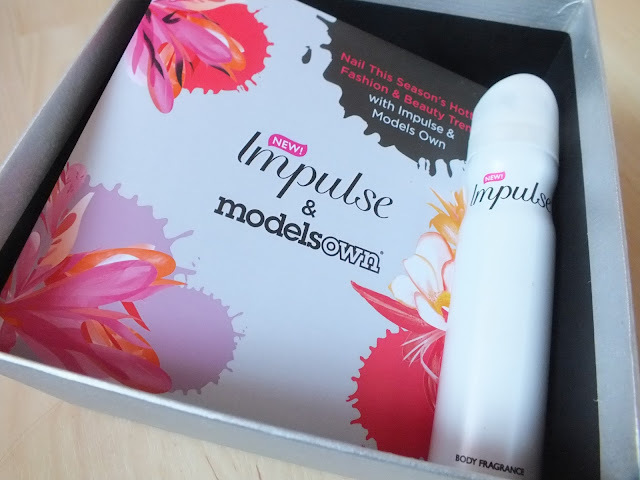 I was sent this gorgeous 'inspiration kit' with little bits and bobs to decorate and design my own Impulse Body Spray! As you can see, I went for a very sparkly, pink, girly look. I actually used glitter nail polishes to attempt to create an 'ombre' effect, then stuck little diamantés on to give it an extra sparkle! I was also asked to create a nail art design too, and as I loved all three Model's Own Colours, I decided to encorperate all three to create my design. 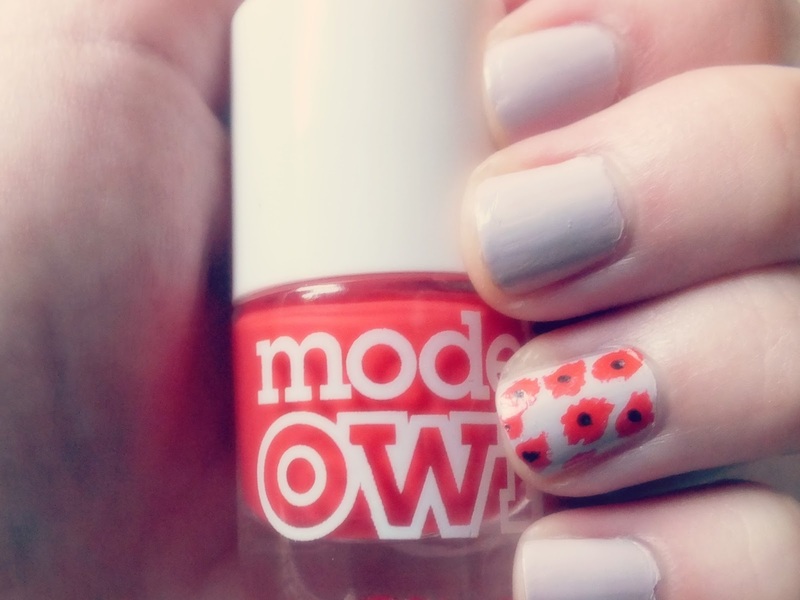 I used Utopia as a base on all my nails, then roughly dotted Coral Reef on in little 'splotches' to create rough flower shapes, then added a tiny dot of Gun Grey to the center of each to make them look like little poppies! I did this on my thumb and ring finger and I really loved the look. It's super easy to recreate and I'd love to see if you give it a go! 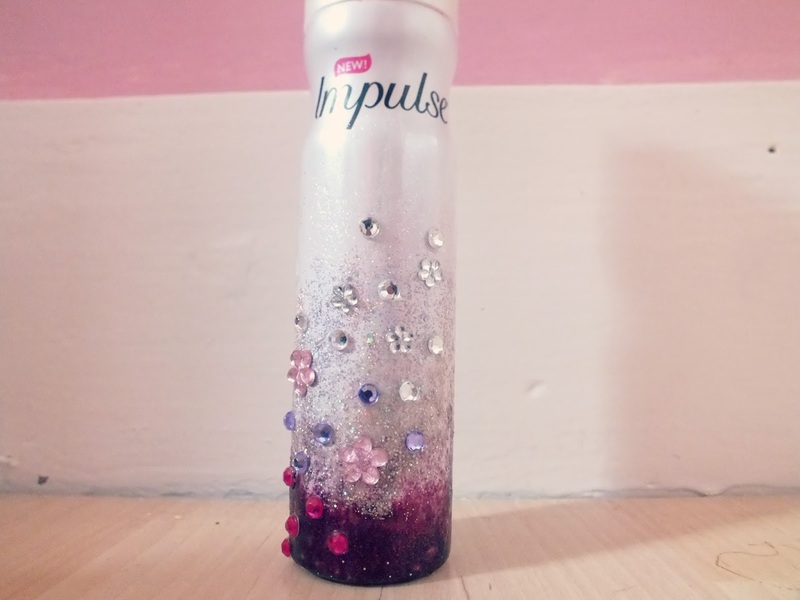 I wanted to do flowers as the Impulse cans all have flowers on them and the scents are largely floral. 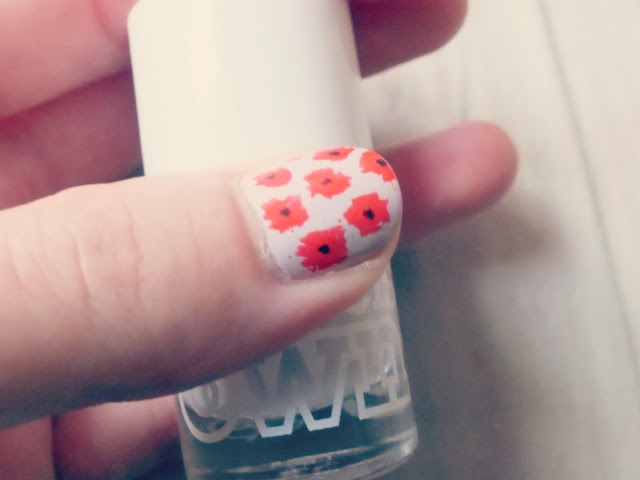 I went for poppies as I thought these colours together created a look perfect for the end of Summer/ beginning of Autumn. Let me know what you think of my designs! I'd love to hear your thoughts! The packaging of the Impulse is so cute! I haven't used Impulse recently, it reminds me of my teen years and desperately spraying before walking past boys! Your nails are gorgeous though! I need to decorate my bottle soon. Eek. You've done a great job of yours Chloe, it looks awesome. I'd definitely buy it if I saw it in a shop! You've made that bottle look so pretty! 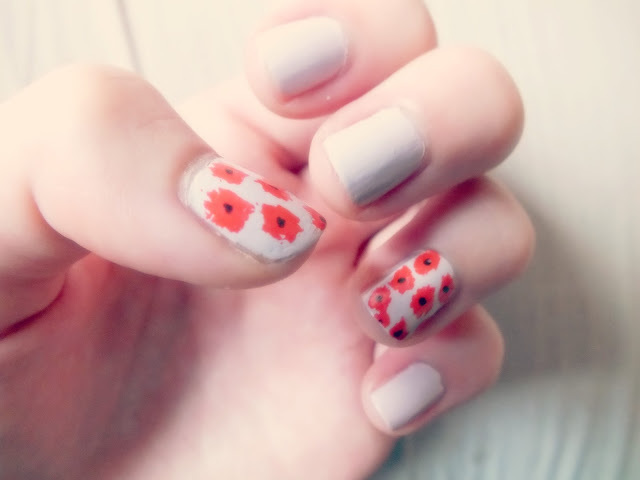 Loving the floral nails too! I love Very Pink and I've wanted to try out Utopia for a while so I might try out very very pink, I might even like it more! i love your nails! the design on especially just the two fingers is super cute! great job Chloe!